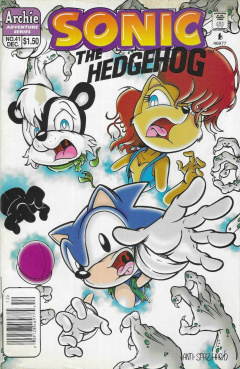 Sonic the Hedgehog 41 is the forty-first issue of the Sonic the Hedgehog comic. This comic features one story: "...And One Shall Save Him". In Robotropolis, Sonic stands on top of a gangway over a large structure. He latches a rope around part of the gangway and then ties the other end of the rope to his legs. He sets up and dives off, flying straight down toward a glass ceiling of the building below. He crashes through, right into the same room as Dr. Robotnik, entering into a spindash to cut off the rope holding him. Despite the guarding SWATbots, Sonic cannot be stopped, as he rips through the guards and accesses a nearby console. With all the damage Robotropolis has suffered from recently, from an earthquake, to the nuclear warheads, and, lastly, Nack the Weasel's jet car, Sonic has no intent on dealing with Robotnik, only wanting one object, which he grabs from an access panel under the console. Two SWATbots enter the room, taking aim at Sonic as Robotnik proclaims that he no longer is interested in roboticizing anymore. Instead, he orders his SWATbots to destroy Sonic. They have a difficult time, as Sonic's speed cannot be matched, running between the bots and escaping the city, leaving Robotnik quite angry at his failure. With his objective complete, Sonic rushes back to Knothole Village, where he is met by Sally and, much to Sonic's chagrin, Geoffrey St. John. Sally asks Sonic if his mission was a success, but before he can reply, Geoffrey interrupts, stating that if he didn't succeed, that she would still have him to depend on. Sonic gets angered at this comment, forcing Sally to yell at both of them, telling them to take the situation seriously. Aside, at a console, Rotor updates the group on the situation, involving the Zone of Silence which they navigated some time prior. Their efforts to stop the Zone of Silence from collapsing, and thus, destroying the universe, failed. He takes the device retrieved by Sonic and scans it, realizing they can use the device to make his neutralizer work, giving them a chance to stop the Zone of Silence from collapsing and to save King Acorn. Sally takes the neutralizer, telling the group that she's going alone due to the risks they encountered on their last journey. Both Geoffrey and Sonic don't take to this lightly, offering to aid Sally on her journey. Once Sonic mentions wanting to join Sally, Geoffrey takes out his bow, telling him that the job is for grown-ups. Sonic responds by showing off his lightning fast speed, going from one side of Geoffrey to the other, then knocking him with a punch to the face. Geoffrey doesn't seem phased by the hit, telling him that he's been hit by harder pillows, starting a scuffle between the two. Sally stops the fight, going between the two, demanding that they save their fight for after the mission. She orders Rotor to open the portal to the zone. Before he does, he gives the group a set of jet packs that he designed specifically for navigating around the Zone of Silence, although he has not had the time to work out all the bugs in them. Sonic asks if he has anything more reliable, as Geoffrey calls out Sonic as a chicken. He sarcastically laughs at the comment, as they suit up their jet packs and enter the portal to save the universe and the King. In the Zone of Silence, on a large rock, Maximillian Acorn addresses his servants in the zone. He senses the arrival of Sonic the Hedgehog, the only foe who has escaped his grasp, but is intent on making sure it doesn't happen again. Before he finishes his speech, a toad tugs on Maxmillian's leg. He apologizes for interrupting, noting that their pack has not been fed for some time, asking for even a crumb to nibble on. Although he is reluctant to do so, he tosses out a handful of bones to the group, though he asks that they pay him back later. As the pack chow down on the bones, Sonic, Sally and Geoffrey appear, grasping a rock floating beside the King. Sally calls out to him, but he still doesn't recognize her, calling out to the pack to stand their ground. Sally tries again to boost his memory, telling him that she is his daughter. He is shocked at the news...until the three disappear, replaced by the toad, who asks who he is speaking to. This confuses the King briefly, until he chooses to actually believe what he just saw. They look on as they see the events of the past, their first encounter with the King in the zone, complete with their own counterparts. Sally takes NICOLE out again, asking her for an explanation. It notes that Dr. Robotnik's experiments with the zone have affected the quantum energy of it. This has created numerous holes in the zone, acting as mirrors to the past and the future, thus, allowing them to see their first encounter with the King. They look at the hole again, now depicting another past event: a caped beggar walking through the zone. The beggar collapses on a rock, prompting Sally to go and help him. Sonic stops her, not sure if the events have already occurred or will occur. They watch the events continue on, as creatures that helped the King before aid the beggar, sending him to a large floating island, to a sanctuary. They remove the hood of the cape, revealing that it is King Acorn. As the servants lead the King to a large furnace in the sanctuary, Sally notices they can't hear anything from the past, so she takes NICOLE out again to get more answers. It confirms that the events they are witnessing are from the past, and that, the farther back images appear, the less real they seem. They watch as the servants outfit the King with his new armor, and his helmet, treating him with the same royalty as back home. As the King starts to lead his new troops, Sonic notes that he is leading them away from a storm. They then realize that he isn't leading them from a storm, but that the storm is real, and that they are caught in the middle of it. The storm flings the group around uncontrollably. Sonic falls to another floating island. He looks up, noticing he has been separated from the others. As he gets up, he hears a familiar voice calling him out, so he turns around. The King, with his javelin pointed right at Sonic, issues his challenge, intent on destroying the hedgehog. On horseback, he declares his superiority of the zone, demanding that Sonic either become one of his servants, or be destroyed. Sonic jokingly asks if they can flip a coin to decide the battle, but before he can finish his thought, he's hit with another magnetic blast, propelling him into the zone space and onto another small floating rock, where he finds Sally and Geoffrey again. Sonic asks if they are alright, but Geoffrey reverses the question, stating that Sonic has been there the whole time. Sally updates Sonic on the situation, as the zone has started to collapse. Now starting to collapse, the zone has become like a whirlpool, with the group being sucked in on their rock. Unsure of how to save themselves, Sally takes NICOLE out again, but even it can't figure out a solution to the problem. Sonic then asks why their jet packs aren't working, allowing them to escape. NICOLE notes that they have run out of fuel from before, and can only be recharged by accessing a positively charged energy source. Sonic then calls out to the group, looking over the edge of the rock. They all look down, witnessing all of King Acorn's troops being sucked into the vortex. As they cling to the rock for their lives, Sally realizes that Rotor's neutralizer contains a positively charged energy source, but to use it would mean the end of the zone and the King. Suddenly, King Acorn arrives on horseback, offering to make the choice for them. He offers to take the device, and letting them live. The events from earlier occur again, as Sally tries to convince him that she is his daughter. It doesn't work, as he has been in the zone for too long. Sonic calls out to Geoffrey, as they have a plan. Geoffrey moves Sally aside, confusing her, as Sonic gets up. He jumps at the King, punching him in the face, while Geoffrey uses the power from the neutralizer to power his jet pack, taking Sally and sending her off to safety. She remains concerned about Sonic, but Geoffrey, with a change of heart, reaffirms to her that he can handle his job. Just like before, Sonic encounters an event from the past, finding himself on a floating rock facing down the King, who demands that Sonic submit himself or be destroyed. He asks to flip a coin to decide his fate, but before he finishes his thought, he races quickly behind the King and punches him in the back of the head, knocking him out. Sonic secures the King and takes his horse to catch up with Geoffrey and Sally, who are surprised and glad to see him. With their objective complete, Geoffrey activates the neutralizer. Back in Knothole, Tails and Rotor watch as the portal activates, and Sonic walks in with the King in his arms. Before any pleasantries, Sonic orders Rotor to get Doctor Quack quickly to help the unconscious King Acorn. Geoffrey and Sonic, meanwhile, are also concerned about the denizens of the zone, but Rotor notes that the neutralizer has saved them, and with the King back, their lives will be better off eventually. Continued in Sonic Quest 1. Doctor Quack is introduced by name. Maximillian Acorn appears again, now saved and returned to Knothole.